This post is sponsored by King Oscar | Thank you for supporting the brands I love and trust. Instant Pot meals have been a total godsend for me lately, and this Instant Pot Spanish Rice With Sardines in Tomato Sauce has come out on top as a favorite. Who’s in charge of dinner at your house? Here, it’s me. (Shocking.) Once in a while my husband will take the reins in the kitchen and it’s so incredibly freeing when he does, but on a regular week it’s typically me who’s left planning or scrambling for a dinner plan. Not because he expects it—my husband is happy to eat a bowlful of cereal or grab takeout on his way home from the office. But I do feel the need to make sure my family is nourished and well-fed. It’s just a trait I carry; a blessing and a curse! But with an Instant Pot, a tasty and wholesome meal like this one can be on your table in less than 20 minutes. Instant Pot Spanish Rice With Sardines in Tomato Sauce. I don’t think I’m ever boiling rice on the stovetop again, friends. This was the first time I attempted rice in the Instant Pot and it was magical. I couldn’t get over just how well the rice cooked—perfectly fluffy and oh-so-flavorful. It cooks in broth, a mixture of juicy tomatoes and punchy chilis, onion, bell pepper, and a blend of aromatic spices. Once the rice is ready, I fold in King Oscar’s brisling sardines slathered in a zesty finger-lickin’ tomato sauce—one that could probably turn just about anyone onto sardines. There seems to be a clear cut divide in the food world: people are either afraid of sardines or they’re part of the cult following that eats sardines straight out of the can. With the taste and quality of King Oscar’s sardines, that’s easy to do. Believe it or not, up until a few years ago I was part of the former group. In my early 20s, I tried some random brand’s sardines packed in water and was left mortified. But, things have changed and if you follow this blog regularly, you know I’m a loyal fan of King Oscar and his fish. Quality is everything, and sometimes it just takes finding the right brand. King Oscar Brisling Sardines in Zesty Tomato Sauce. My love for King Oscar products knows no bounds, which works out nicely, because the versatility of their product is equally boundless. With King Oscar’s Brisling Sardines, I’ve been able to create everything from simple pasta dishes to swoon-worthy brunch plates; fiery tacos to deliciously messy egg sandwiches. And with their broad range of flavors, it’s impossible to not be struck with inspiration. Aside from being delicious, these gems are good for you and the planet. Sustainably wild caught from Norway’s fjords and coastal waters, these sardines are of the highest quality. They’re smoked over oak wood and carefully hand-packed with a zesty tomato sauce made from tangy, sun-ripened tomatoes. If you really want to kick things up, you could also try this recipe with King Oscar’s Brisling Sardines in Tapatío Hot Sauce. This 20-minute Instant Pot Spanish Rice With Sardines in Tomato Sauce is nutritious, flavorful, and so easy to throw together! Set the Instant Pot to its Sauté mode. When your Instant Pot is hot, add the oil. Then, add the sliced garlic, diced onion, and diced bell pepper. Sauté for 2-3 minutes; stir often to prevent the garlic from burning. Add the uncooked rice and stir to coat the rice in oil, mixing it well with the onion, garlic, and pepper. Transfer the vegetable broth, crushed tomatoes and chiles, and spices to the Instant Pot. Stir everything well to combine the ingredients. Turn the Sauté function off by clicking on the Keep Warm/Cancel button. Place and secure/lock the lid on your Instant Pot and ensure that the pressure knob is set to the Sealing position. Click on the Manual button and set the Instant Pot to cook, on High Pressure, for 8 minutes. Once the 8 minutes is up and your Instant Pot starts to beep, it will start its natural release process. Let it naturally release for 5 minutes. After 5 minutes, carefully move the pressure knob from sealing to venting for a quick release. Steam will spit out of the valve, so be careful. Once the steam has fully released, it's safe to remove the Instant Pot lid. Fluff the rice with a fork. Finally, transfer the contents of the brisling sardines in tomato sauce into the Instant Pot. With a large spoon or spatula, break the sardines down into chunks and stir into the rice. Garnish with freshly chopped parsley and serve. If you can't find King Oscar's Brisling Sardines in Zesty Tomato Sauce, you could snag a can of their Brisling Sardines in olive oil, drain the oil, and add them to the Instant Pot with 2 heaping tablespoons of your favorite tomato sauce. What a great idea! My family loves King Oscar sardines, and even eat them right out of the can. I love adding them to favorite rice dish to complete a meal, and so easy too! Loving the spice mixture as well, and can't wait to try this out! I haven't had a sardine in years, but after reading this I am zipping out to the stores tomorrow and this is going to be dinner - I have such a hankering for sardines now. Love that it comes together in the instant pot too, that thing is such a time saver! Well, I 'm still searching for the King Oscar brand -- I'm determined to find it. We do like sardines and I'd love to cook with them. I do have an Instant Pot on my Christmas Wish list. I'd love to be able to easily make rice in it. Your rice certainly looks like a fantastic and flavorful dinner. I just got an Instant pot and have been collecting recipes! Pinning this one !! While I'm on maternity leave I'm on dinner duty but once I go back to work, it'll be my husband so I'm getting recipes ready for him that he can throw together nice and quick! I feel the same way about rice in the instant pot! It comes so perfectly cooked and fluffy, and you don't have to worry about any scorching at the bottom of the pan, as you do if you don't appropriately babysit a pot of rice on the stove. 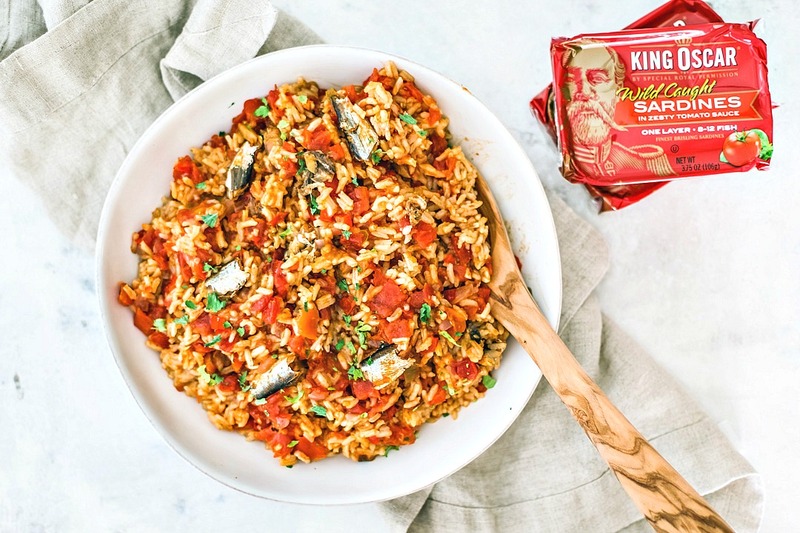 What a great idea to add King Oscar's sardines to the Spanish rice! This dish must have such great flavor. I have to look for the sardines in zesty tomato sauce! I love King Oscar's sardines! And those tomato sauce ones are SO STINKIN delicious!! I haven't managed to buy an Instant Pot yet... but this does sound amazing! Maybe you've convinced me lol. Rice takes SO LONG to cook!! I haven't made Spanish rice from scratch in a long time. This reminds me how much I loved it. The addition of the sardines is genius, I think that's a great pairing. I'm saving this for later. Thanks for this recipe! I'm definitely afraid of sardines. I always recommend as a healthy protein and source of omega-3s but they're one of the only foods I just can't bring myself to try! I love the addition of sardines to this dish. I've been having lots of sardine sandwiches lately, but that's about where my use of sardines stops. Thanks for the new idea!! This rice looks so delicious and flavourful! My bf LOVES sardines so he's going to have a hoot when he sees this since he's only starting to realize what my IP can make! The zesty tomato sauce sounds so good so I'm excited to try and find a can! This recipe has my name all over it. Hubby LOVES rice and I"m always looking for new and interesting ideas. I have been reading lately about the health benefits of sardines and didn't have any ideas of how to incorporate more into our diets. Plus, I have a brand new insta pot wanting to be used more often. You hit the trifecta with me! I am firmly in this third group where I WANT to like sardines...they are so good for you, but I just haven't been mentally able to get past the idea that I shouldn't like them. I buy sardines with the hopes that maybe this time I will eat them, but then end up giving them to my mom haha I think this recipe and this brand, might be just what I need to get over my fears! I just made Spanish rice last weekend...but not with sardines. This would be a complete meal for sure. I have never had any protein added to my Spanish rice recipe before. I think this is worth a try....since I can make a meal on rice alone.